If you don’t celebrate Passover and have no need to make lasagne out of matzoh, I am so sorry this post likely doesn’t appeal to you. 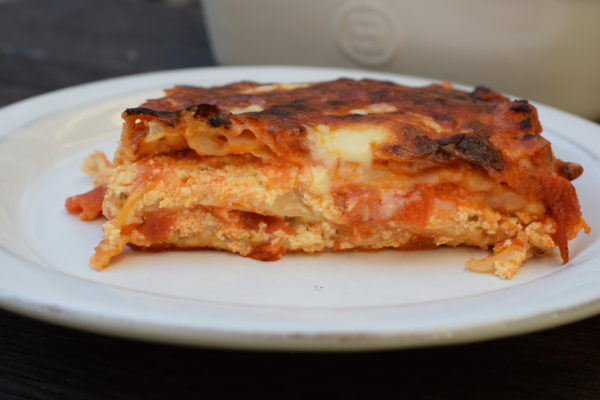 Although I must mention that our not-Jewish friend Matt had my matzoh lasagne last year and keeps talking about it nonstop. In fact, just the other day he invited himself over the next time I make it. Why is it that the non Jews look more fondly upon Passover foods than Jews? When we were growing up, my mother and grandmother used to buy 5 pounds of matzoh when it came into the stores because they absolutely loved it with some Breakstone’s whipped butter in the morning. I’ll admit, I liked it quite a bit, too. Now that I am married to someone who actually celebrates Passover, the sight of matzoh makes me cringe a little. Is it because when you’re “forced” to eat something, it takes on a different feeling? Probably. My mother, who has also tasted my matzoh lasagne and complimented me on it, called me the other day to tell me she once again bought her 5-pounds. “Well, you’re ahead of me,” I told her, since I hadn’t bought a single unleavened product in preparation for the 8-day holiday. Truthfully, I don’t love the packaged Passover foods and matzoh isn’t exactly nutritious since it’s just wheat flour. Although I am so grateful for the more healthful options from the last few years like organic matzoh, gluten-free and spelt matzoh. Progress! Sorry to say I haven’t tried this with gluten-free matzoh, but I don’t see why it wouldn’t work. 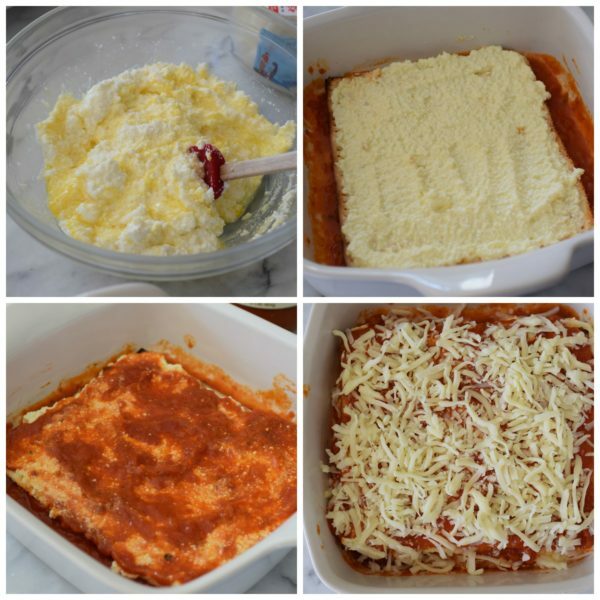 The technique is very straightforward and almost identical to making lasagne with pasta. The only difference is that you have to soak the matzoh very briefly in water to soften it slightly. And then you layer ricotta cheese with egg, sauce and mozzarella, soaked matzoh, ricotta cheese with egg, sauce and mozzarella, and finally soaked matzoh, sauce and mozzarella. Include some grated Pecorino for extra flavor, if you wish. My husband and Mr. Picky prefer meat sauce and the girls and I like a veggie version, so I usually make 2 8 x 8 pans to accommodate everyone. Feel free to adapt to your liking. 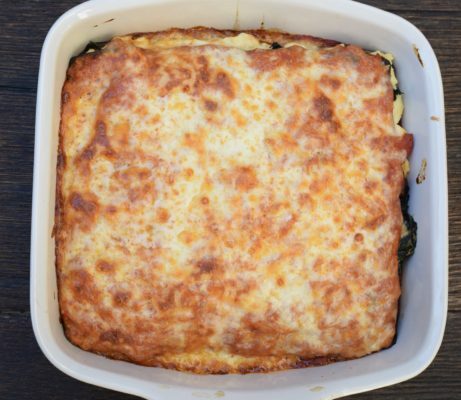 Basically, take your favorite lasagne, and adapt it with matzoh. For the veggie one in these images, I used Kite Hill vegan, almond milk-based ricotta. If you can find their products, they are the best dairy-free cheeses out there. Delicious and clean. You don’t even need the mozzarella, I think. Any grain-free muffin, like Chocolate-Banana-Chia Seed, Orange-Cranberry Almond Flour (which I adapt to blueberry, chocolate chip, raspberry, etc. ), Banana-Carrot Almond Flour. More of a dessert, but always a fave in this house is the grain-free chocolate zucchini cake , apple cake, and grain-free salted chocolate chunk cookies. Basically any Paleo recipe is good for Passover and there is no shortage of those around. Check out my Paleo Pinterest board for some inspiration. I hope you all have a beautiful holiday! Fill a baking dish with about an inch of room temp or tepid water. This will be for soaking the matzoh. In a small bowl beat the egg, and add 2 Tablespoons pecorino and the ricotta. Combine well. Soak 1 sheet of matzoh in the water for about 45 seconds, just to soften. You don’t want it to fall apart or become mush. Place the soaked sheet of matzoh in the baking dish. Spread ½ of the ricotta mixture on top of the matzoh. Spread ¼ cup sauce on top of the ricotta. And sprinkle with ⅓ cup mozzarella cheese. 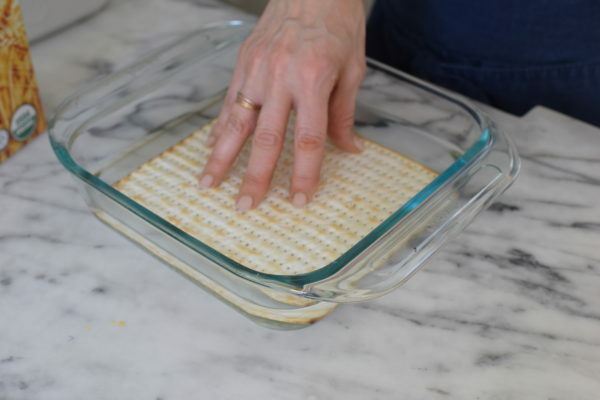 Soak the second sheet of matzoh for 45 seconds and place in the baking dish. Repeat with remaining ricotta, ¼ cup sauce, and ⅓ cup mozzarella. Soak the last piece of matzoh for 45 seconds and place in the baking dish. Spread with ¼ cup sauce (or more) and top with ⅔ cup shredded cheese and a Tablespoon of grated Pecorino or Parmesan, if desired. Cover baking dish with aluminum foil and bake for 30 minutes. Uncover and bake until cheese is golden and lasagne is bubbling, about 10 more minutes. 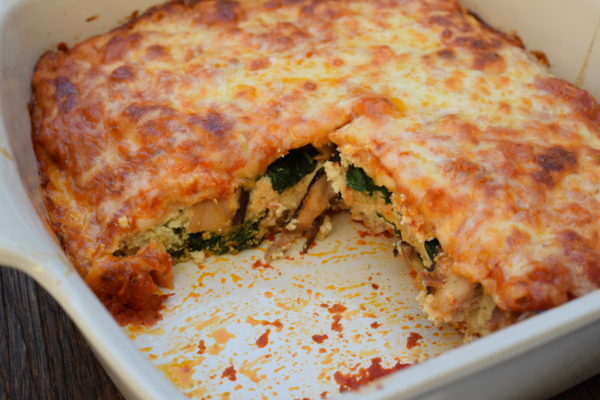 If sides are bubbling, but you want the cheese more golden quickly, stick it under the broiler for 10-30 seconds. To double this, use a 13 x 9-inch baking dish. 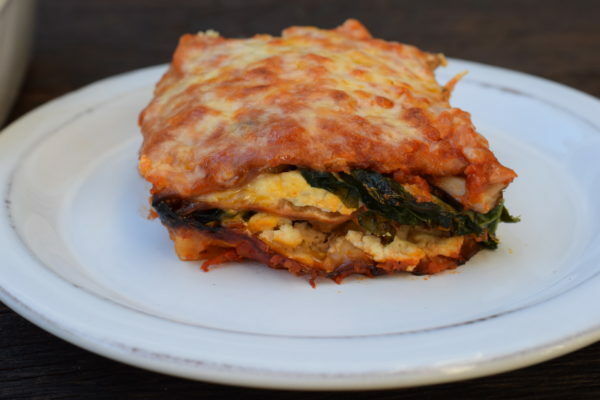 anyone who observes passover enough to make lasagna with matzah would not have a cheese and sausage lasagna. I teach in a lot of Jewish homes and everyone has their own rules about Passover, keeping kosher and the like. I’m the last person to judge. I did mention in the body of the post that you can make this dairy-free with Kite Hill almond milk products, so for someone more strict, that person can do this with meat and dairy-free. Can you prepare this recipe a day in advance and then bake it the following day will that work? I honestly don’t know! I think if I were to prep it a day in advance, maybe I wouldn’t soften the matzoh before assembling. Just a thought! I made 2 matzoh lasagnas yesterday and they were completely devoured. Everyone (Jews and non-Jews) loved it. I will be making this every year during Passover. Thank you for the recipe. 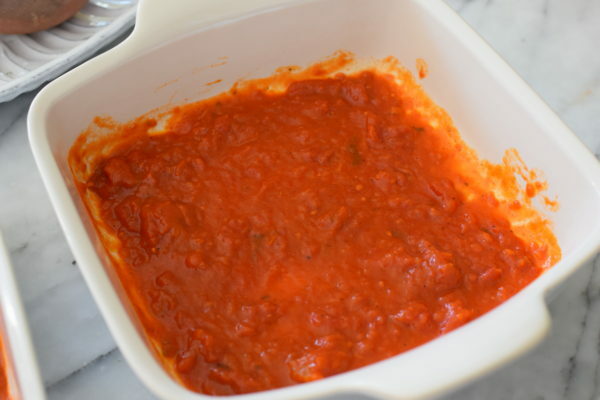 what marinara sauce did you use?